It's the biggest party in the state, and you're invited! Enjoy 20 days full of food, fun, music, comedy, animals and entertainment! 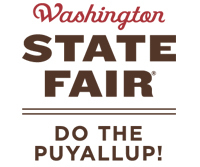 Click the "Buy Tickets" button to purchase Washington State Fair admission, ride and transit tickets. Get your tickets by Aug. 30 for the best savings! Avoid traffic & parking, and leave the driving to us! We've partnered with Sound Transit and Starline Express for a variety of transportation and shuttle options to make your journey to the fair easier! Includes one Fair gate admission and one round-trip ticket to ride the Sounder Fair Express Train on Saturday, Sept. 15 OR Saturday, Sept. 22 with service to the Puyallup Station. Take the Starline Fair Express Shuttle from the Kent Park & Ride (902 W James Street) each Saturday of the Fair! Buses depart the park & ride location at the top of each hour with return trips running from The Fair's Blue Gate Parking Lot until 11pm*. One-way and round-trip options.